Two young athletes sat respectfully on the stage as we entered and sat in “The Gathering Place” inside the beautiful Alaska Native Heritage Center in Anchorage. A small tethered ball covered in seal skin and fur hung conspicuously from a tall wooden pole. 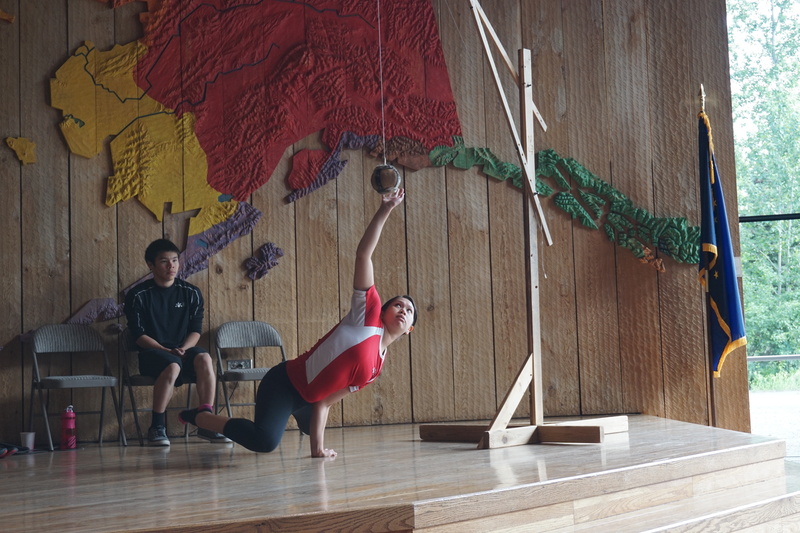 Our group from the Iditarod Summer Teacher Conference waited with quiet excitement to see some examples of the Native Olympic games. Our star athletes on stage shared with us not only many remarkable athletic moves this day, but also the history and traditions of their people. Why are these games important to them? What are they learning from this experience that draws them closer to a connection with their culture? The mission of the Alaska Native Heritage Center states that its organization: “preserves and strengthens the traditions, languages, and art of Alaska’s Native People through statewide collaboration, celebration, and education.” The specific moves in the games come from the moves needed to survive in the wild long ago, such as jumping from ice float to ice float. Judging by the dedication and passion of these two remarkable young people, the ANHC is meeting its mission to preserve and nurture the history of the native people of Alaska.